Marlink has re-established their commitment to Hapag-Lloyd Cruises to provide the company's Sealink services on the latter’s fleet of four cruise vessels, plus two new cruise ships that are due to enter operational service in 2019. The contract renewal reflects Hapag-Lloyd Cruises' desire to meet the requirements of the growing market for adventure and expedition cruises, as the ships are now in remote areas that were previously considered inaccessible for cruise ships, such as Arctic and the Antarctic. Marlink’s global Sealink services provide stable, dependable and flexible global connectivity for secure onboard ship management, enabling seamless internet access for passengers and crew alike, and providing carrier services for onboard GSM services for passenger voice, SMS and data connectivity. The recent addition of new satellites and overlapping Ku-band beams to the Sealink network reinforces the company’s status as the natural and obvious choice to accompany Hapag-Lloyd Cruises’ ongoing expansion into expedition cruises. 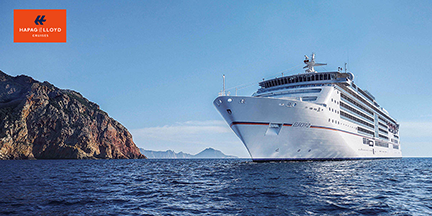 Marlink’s well established partnership with Hapag-Lloyd Cruises spans more than a decade to date, with EUROPA being the first cruise vessel in the fleet to deploy Sealink connectivity services, in September 2004. This was followed in turn by BREMEN in August 2006, HANSEATIC in May 2007 and EUROPA 2 in April 2013. HANSEATIC is due to leave the fleet in October 2018, but three new cruise vessels, HANSEATIC nature, HANSEATIC inspiration and HANSEATIC spirit, are currently under construction and are due to be delivered from the shipyard in Norway in April 2019,October 2019 and 2021 respectively. Marlink’s solution for Hapag-Lloyd Cruises is based on a dual onboard VSAT system to supply redundancy and increase operational availability, which is further enhanced by multiple backup services, which optimize available bandwidth in the most remote areas. Hapag-Lloyd Cruises is branding HANSEATIC nature and HANSEATIC inspiration as ‘expedition class’ ships, with features including retractable glass balconies on the sun deck, a terraced Observation Deck and an Observation Lounge offering 180° panoramic views as well as permanently-mounted binoculars and innovative on-board centres of knowledge to emphasize the immersive nature of the company’s expedition cruise portfolio. Exciting destinations already include Antarctica, the Amazon River, the fjords of Chile and the heart of the Northwest Passage. Marlink’s VSAT network coverage from Canada’s east coast to the western tip of Alaska, has been facilitated by the recent addition of a new satellite, and this virtue is broadly representative of the overlapping connectivity which ensures that Sealink is synonymous with optimal, comprehensive high throughput onboard services, even in the most distant regions. Tore Morten Olsen, President Maritime, Marlink, said the company is excited to be in a position where the firm can continue this mutually beneficial relationship with Hapag-Lloyd Cruises into the future. The fact that Marlinkn's Sealink services have been selected for the company’s two new flagship cruise vessels corroborates the long-standing reliability and impeccable standard of service that Hapag-Lloyd Cruises have justifiably come to expect from Marlink.